Posted on April 10, 2013, 4:28 pm, by Thomas Hawk, under Getty Images. 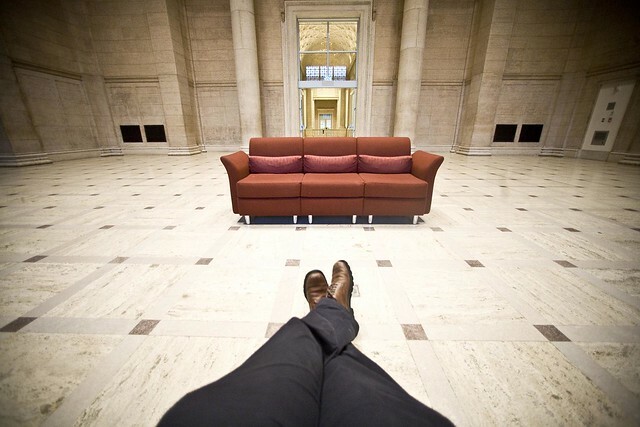 Last week photographer Remi Thornton penned a post about why he quit working with Getty Images. Remi alerted photographers to a new scheme by Getty Images whereby they were “loaning” photographer images (without pay) to Cafe Press for marketing purposes. The idea is that Cafe Press could use photographers’ images without paying, unless a sale was made, then a photographer might receive a royalty. Allowing Cafe Press free use of photographers’ images for marketing did not sit right with Remi or other photographers, Remi felt that Cafe Press should have to pay a royalty for using the image at all and not get to use the images to market Cafe Press for free. A few days later my images disappeared from Getty’s website for sale. One would think that upon termination with Getty Images, the pilfering of images by Cafe Press would cease, but not so. Not only are my images still up for sale with Cafe Press (being marketed in a large font as “Thomas Hawk Gifts”), Cafe Press is additionally ADVERTISING them to me to buy on Facebook (again without pay — see image above). Even though I no longer have a relationship with Getty and have NEVER had a relationship with Cafe Press, they want to sell me a dry erase board of a dog image of mine. I can also buy a wine charm thing or a beer coaster if I want. I’m sure in the super fine print of my contract with Getty there is some loophole that is allowing this, but frankly it’s bad enough that Getty is allowing Cafe Press to market our images without pay. To further allow our images to be marketed in Facebook ads (again, without pay) seems a bit far fetched — especially when my relationship with Getty is supposed to be terminated. And why is Cafe Press specifically targeting me on Facebook trying to sell me my own images? I have no idea how long my images must remain for sale at Cafe Press, but this just serves as an example of how a photographer can lose control over their images with Getty. I wonder how much money Getty was paid to allow Cafe Press to use our images for free on Facebook? I’d ask Getty what the deal is in the Contributor forum, but alas, I’ve been permanently banned from the Contributor forum for daring to criticize Getty’s paltry 20% payout. Maybe someone who is still a member there can ask them for me and relay back what their answer is? So is the New Flickr/Getty Request to License Feature a Good Deal or Bad Deal for Flickr Photographers? Posted on June 23, 2010, 9:19 am, by Thomas Hawk, under Flickr, Getty Images. While I was out of town last week, Flickr/Getty launched the latest new twist to their stock photography arrangement, “Request to License.” Already Getty images is representing more than 100,000 flickr images on Getty for Getty’s customers to purchase. I’ve participated in this stock offering since it launched, and Getty currently represents 190 of my images (that you can see here). The new twist is smart from Flickr/Getty’s standpoint. As many, many, many of the photos that buyers are finding online are being privately negotiated between buyer and seller, Flickr/Getty are looking to get a piece of this action. With this new “request to license” feature, Flickr/Getty is allowing you to post a link directly to Getty images on all 100% of your Flickr photos. If a potential buyer sees this link and wants to license your image, they can click the link and license the image through Getty. Getty/Flickr keep 80% of the money and you get 20% of the money. So why am I declining to participate in this new venture? Simple. I don’t think I’ll sell 5x as many photos through Getty this way as I’d sell myself from private inquiries. I get inquiries about my photos all the time. Every week at least I get someone wanting to purchase one of my photos. These buyers have been magazines, text books, newspapers, websites, advertisers of every shape and form. I’ve been offered money for Holiday cards, billboards, television commercials, whatever. In fact the single largest source of my photography related income comes from people contacting me directly after finding my images on Google Image Search, my blog, Flickr etc. Most of the time when people want to license one of my images it’s for a very specific photo, for a very specific reason. Last month Outdoor Magazine contacted me about using this image of the Iron Door Saloon in Groveland for $250. The photo’s not particularly great, but I suspect that they are running an issue on Groveland or something and it’s a very specific image that they wanted to buy. Now, as it stands, I simply sold them a license to the image and emailed them a simple invoice for $250. Pretty easy. Had they seen the same image of mine and chosen to license it through Getty for the same amount, I would only have gotten $50. So why would I want to get $50 instead of $250? You might be able to argue that people will feel more comfortable negotiating directly with Getty, a known and established provider of images who has a strong reputation in clearing images. You might even be able to argue that this comfort factor would allow you to sell twice as many images through Getty as you would directly. But 5x more image sells? I seriously doubt it. Other than me advertising for Getty on over 40,000 images of mine on Flickr, what are they doing exactly to earn their 80%? Are they promoting these images in search on their website? No. Images that I presently license to Getty are indexed in their search engine and promoted by them. Even then I think the 20% payout is too small. But to simply redirect commercial inquiries on my images from me to Getty for an 80% cut? This doesn’t make sense to me at all. I’ve also found that people respond very differently to images when I post them online non-commercially vs. offering them for sale. Many of the images in my stream never would be able to be licensed by Getty. They are of people without model releases etc. So why advertise for Getty on images that I will never be able to sell that also might send the wrong message to a subject who is in a non-commercial photograph that I’ve taken? I can see where this deal might seem great for Getty/Flickr. I suspect that there is a big pot of money that they both are missing out on right now in terms of privately negotiated licensing between buyers and photographers directly and they’d like to get their hands on this money. But I think it’s a bad deal for photographers and I personally won’t be participating in it. My advice to Flickr/Getty would be to bump the payout up on these images to 50/50. Here’s a link to a discussion from Flickr members on this new offering from the Flickr Help Forum (where I’m permanently banned). It seems that most photographers representing an opinion on this new offering there are also negative about it. Oh, and Google? If you’re listening, I think there’s a great opportunity in all this for you. Eliminating the middle man is one of the things that you do best. I like the 68% payouts I get on my Adsense ads with you a lot more than the 20% payout I get from Getty. Posted on June 12, 2009, 12:04 pm, by Thomas Hawk, under Flickr, Getty Images, stock photography. Getty Images announced today that they have created a new front door for their Flickr Collection and that they have also added a “cloud” type imagery widget for Facebook pages and blogs. The new Flickr Collection front page features balls of rotating photos as built by contributors on the site. You can use the Getty Images site to build interesting clouds of 5 – 30 rotating images from the Flickr/Getty Collection and then Getty will make a cloud of these images. When you mouse over the cloud it rotates and speeds up and you can select any image to pull up a larger version of that image and get to the page where that photo is able to be licensed. If you want to build a cloud of just your images, you need to search by the photo number of each of your photos that Getty has assigned and can add them one by one (up to the 30 photo max). To see what this looks like and feels like you can click through to a cloud of my images here. Today the Facebook and blog widgets allow you to link to Getty clouds of the most recent clouds on their page, but in the next roll out of this widget they are going to allow you to just link the widget specifically to a single cloud of your choice. This would seem to me to be a smart way for Getty to extend their marketing reach through blogs, facebook and social media to bring more potential buyers to their site and a smart way for photographers to show off some of the work that they have for sell through Getty on their own pages. To get to the widgets you can go to the main Flickr Getty front door homepage here and click on Explore. In the lower left hand part of the page is a menu item called “Inspiring Downloads,” where you can get these widgets. Here is also a direct link to the widget on Facebook. 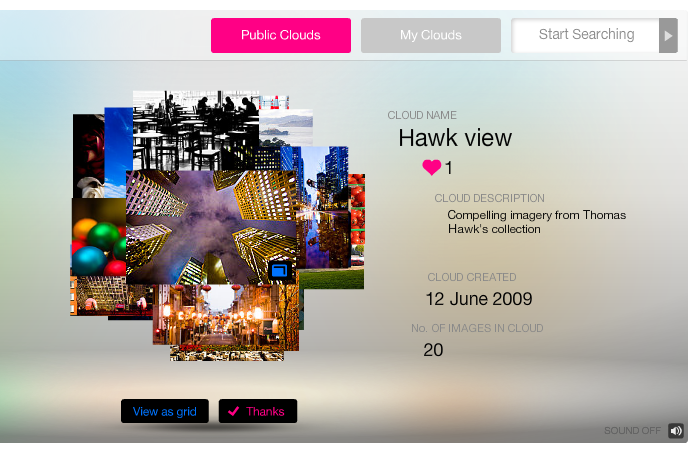 There is also a new screensaver app that you can install that will use the most recent Getty clouds to your desktop. Posted on May 20, 2009, 11:46 am, by Thomas Hawk, under Flickr, Getty Images, stock photography. I thought I’d put out a post after I received my first earnings report (which I received today) from stock photography agency Getty Images. I signed up to have Getty represent 60 of my individual photographs as part of the recent deal between Getty Images and Flickr. The Flickr/Getty arrangement is by invite only and Getty initially selected about 90 of my images. I listed all of the images that they asked for that didn’t need model releases (which was 60). Most of the other images that they wanted where model releases were needed are of me or my family, so I’ll probably add those to the collection as well in the next few weeks. So in my first month of production with Getty I sold two of the 60 images. Those two images totaled $689.97 in fees to Getty and $138.00 (my 20% cut) to me. At the same time that I’d signed up with Getty I also listed 24,917 of my photos with the upstart stock photography agency ClusterShot. ClusterShot, started by Canadian web development company silverorange which was co-founded by Pal Daniel Burka (who is also Creative Director at Digg), offers photographers an ability to list their photos there and pays them out 88% of the proceeds. Unfortunately in my first month or so with ClusterShot I didn’t sell any photos. Which raises the question, is 20% of something better than 88% of nothing? While I really, really, really like the ClusterShot model, and especially the fact that the majority of the sales proceeds go to the content creator, unless companies like ClusterShot are able to attract buyers to buy these photos, I’m not sure how successful they will end up being in the end. There is something to be said for Getty’s dominant role as the largest provider of stock photography in the world. Because Getty has the existing customers already signed up, at least today, it seems like they are far more likely to sell more images than ClusterShot. On the other hand, you can sell a lot fewer images at ClusterShot and still make more money because the payout there is so much higher. At present I’m trying both to see how they both work. I think another area where Getty has a big advantage is in their reputation for clearing images. Especially in today’s litigious environment, image buyers are likely to feel more comfortable with Getty’s vetting of images for needed model and property releases than they might be for ClusterShot’s free for all. At ClusterShot there is no image review process where they determine if images need releases or not. And while in some cases (say an image of flower or a rose) no release may be needed, in many other cases a model release is clearly needed. Since the image buyer is ultimately the one on the hook for publishing images without correct releases, an image buyer might consider an agency like Getty as a safer place to purchase their images. More than both Getty and ClusterShot though, the majority of my licensing income last month came from direct purchases. I sold five photos directly last month for about $2,000 total. I got to keep 100% of that. I was not marketing those images directly in any meaningful way, they were just inquiries that people sent my way after finding images of mine that they wanted to use on Flickr, Google Image Search, etc. The buyers were natural buyers of stock photography, a couple of magazines (including Popular Photography), a visitor’s convention bureau, a local newspaper and a private company for their brochure. Now in the future things very well may change. Personally I think it’s more likely that you’d see ClusterShot (or a company like them) gain traction and market share than it is that I’d see Getty raise their payouts. In the meantime I’ll continue in the near term using both and watching and reporting on how things go. I will say also that I’ve been pretty impressed with things from the service side of Getty Images. I had some initial glitches getting my photos on their platform, but they fixed my problem and I’ve found the Getty staff to be very helpful and responsive in the Flickr/Getty members only forum on Flickr. Late last week Getty also invited all existing Flickr/Getty members an opportunity to submit five new images to Getty in a promotion entitled “It’s Your Turn.” Apparently Getty is also in the process of inviting additional images into their collection both from new and existing Flickr/Getty contributors, although they have not invited any additional images of mine since the first 90. I think one of the cool things also with ClusterShot is that they can use the Flickr API to pull your photos directly from Flickr for sale. This makes it far easier than uploading your shots directly to their site. They also pull over your tags and keywords in this process so that your photos are immediately optimized for search on their site. You can also set ClusterShot up so that they pull over all your new photos to their site for sale as you upload them to Flickr as well. That’s slick. If you want to see my Getty Images presently for sale, you can see those here. If you want to see my ClusterShot Images presently for sale, you can see those here. – We take it as a huge compliment to even be compared to Getty. They are so well established. Our site is brand new. – We want to build tools to easily facilitate and automate the sale of that $2,000 you sold privately. We’re going to be building more tools and features focused precisely in that area in the months to come. Hopefully they’ll be useful enough for you to use. – Right now we are trying to not be perceived as a destination to come and look for stock photos. At least initially. There are many people much better at storing, searching, and sharing photos than us. We want to make the service that sells the photo and ties into all of those other great sites. We’re going to building a full API for this in the coming months. This API will also be encourage to be used by makers of self-hosted gallery solutions as well. – Currently we have ~1,000 photographers with 160K images for sale. Virtually all of our sales (which is in the dozens, not hundreds) are from photographers who are using ClusterShot as a place to feature and promote their work to previously established offline customers. Posted on March 11, 2009, 9:30 am, by Thomas Hawk, under Flickr, Getty Images, stock photography. I haven’t had a good chance yet to try out the new service but thought I’d offer some of my thoughts on the service here. I just received an invitation from Getty Images to participate in the collection on 95 of my photos, but only yesterday, so I haven’t had a chance yet to either decide what to do or sign up for the service. Although the number of Flickr photographers invited into this program has not been made public at this point, the private “contributor only” group at Flickr currently shows 6,890 members. This is a group that you get invited to when you accept their agreement. Doing a couple of quick searches, at least as of this morning, in the new Flickr collection you will find some reasonably popular search subjects somewhat sparse. For the search “San Francisco,” the new collection only brings up only 60 flickr images for sale. Another search for kitten (something Flickr of course is famous for) only brings up nine images for sale. One the positive side, it does appear that some of the Flickr images for sale have made their way to first page search results for broader image search requests across all Getty images collections. A search for the term “San Francisco” across all Getty collections shows nine Flickr photos on the first page of 67 pages available for sale. I’m pleased to see that Flickr photos seem to be getting good placement across Getty’s overall search engine. I suspect that I will probably end up licensing at least some of the 95 photos that Getty has selected of mine to be included in this offering — if for no other reason than to try the service out and see how it goes. The thing that I like about this offering is that Getty Images, as the world’s largest stock photography agency, has amazing reach. Although I’ve sold lots of stock photos myself, I wonder how much better of a job Getty could do selling them than I can. I also think it’s interesting that as part of the contract with Getty that they also will go after copyright infringement settlements for you on the images that they represent. I also don’t like the fact that by signing up for the service are committing to a two-year contract with Getty Images. During that two year contract Getty has the exclusive rights to market the images that you offer through them. So, for example, if you have an image that is not selling through Getty and say a magazine wants to buy it for $500 you can’t sell it to them. Of course you could always point them to Getty to buy it, but you would not be able to offer it. Another issue with this offering is that Getty requires all images included to be registered as “all rights reserved,” even though it would seem that a Creative Commons non-commercial license ought to be sufficient. Ben Metcalfe started a lengthy thread discussion on this issue that you can read more about here. Flickr user Striatic also has a lengthy thread on problems that he has with the Getty contract here. Another interesting conversation (with 94 comments) about the Getty offerings is taking place on one of John Curley’s photos “team getty?” over here. You can read the official Flickr FAQ on the new offering here. Getty has an FAQ for contributors here. Getty images has a blog post up on the new offering this morning here. There is a private members only group for Getty Images contributors on Flickr here. Additional reading: USA Today: Online photo services can give shutterbug lucrative outlet. 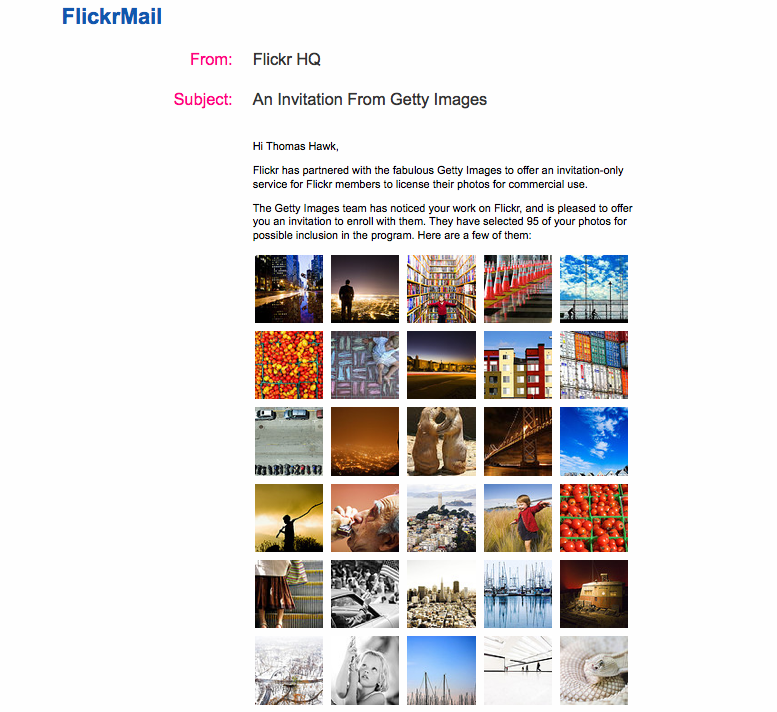 ZD Net: Getty Images, Flickr launch licensing, distribution deal. CNET: Selected Flickr images now sold through Getty.